shrubland or heathland plant community found primarily in the US state of California and in the northern portion of the Baja California Peninsula, Mexico. Chaparral (/ˌʃæpəˈræl/) is a shrubland or heathland plant community found primarily in the US state of California and in the northern portion of the Baja California Peninsula, Mexico. It is shaped by a Mediterranean climate (mild, wet winters and hot dry summers) and wildfire, featuring summer-drought-tolerant plants with hard sclerophyllous evergreen leaves, as contrasted with the associated soft-leaved, drought-deciduous, scrub community of coastal sage scrub, found below the chaparral biome. Chaparral covers 5% of the state of California and associated Mediterranean shrubland an additional 3.5%. The name comes from the Spanish word chaparro, for evergreen oak shrubland. In its natural state, chaparral is characterized by infrequent fires, with intervals ranging between 30-150+ years. Mature chaparral (stands that have survived for greater intervals between fires) is characterized by nearly impenetrable, dense thickets (except the more open chaparral of the desert). These plants are highly flammable during the late summer and autumn months when conditions are characteristically hot and dry. They grow as woody shrubs with thick, leathery, and often small leaves, contain green leaves all year (are evergreen), and are typically drought resistant (with some exceptions). After the first rains following a fire, the landscape is dominated by small flowering herbaceous plants, known as fire followers, which die back with the summer dry period. Similar plant communities are found in the four other Mediterranean climate regions around the world, including the Mediterranean Basin (where it is known as maquis), central Chile (where it is called matorral), the South African Cape Region (known there as fynbos), and in Western and Southern Australia (as kwongan). According to the California Academy of Sciences, Mediterranean shrubland contains more than 20 percent of the world's plant diversity. The word chaparral is a loan word from Spanish chaparro, meaning both "small" and "dwarf" evergreen oak (typically holm oak and kermes oak species), which itself comes from a Basque word, txapar, that has the same meaning. Conservation International and other conservation organizations consider chaparral to be a biodiversity hotspot – a biological community with a large number of different species – that is under threat by human activity. In southern and central coast adjacent and inland California regions, including covering some of the mountains of the California Coast Ranges, the Transverse Ranges, and the western slopes of the northern Peninsular Ranges. Fauna of the California chaparral and woodlands. 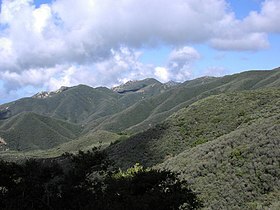 Another phytogeography system uses two California chaparral and woodlands subdivisions: the cismontane chaparral and the transmontane (desert) chaparral. Cismontane chaparral ("this side of the mountain") refers to the chaparral ecosystem in the Mediterranean forests, woodlands, and scrub biome in California, growing on the western (and coastal) sides of large mountain range systems, such as the western slopes of the Sierra Nevada in the San Joaquin Valley foothills, western slopes of the Peninsular Ranges and California Coast Ranges, and south-southwest slopes of the Transverse Ranges in the Central Coast and Southern California regions. For more flora species, see Category: Natural history of the California chaparral and woodlands. For more bird species, see Category: Fauna of the California chaparral and woodlands. Transmontane chaparral or desert chaparral —transmontane ("the other side of the mountain") chaparral—refers to the desert shrubland habitat and chaparral plant community growing in the rainshadow of these ranges. Transmontane chaparral features xeric desert climate, not Mediterranean climate habitats, and is also referred to as desert chaparral. Desert chaparral is a regional ecosystem subset of the deserts and xeric shrublands biome, with some plant species from the California chaparral and woodlands ecoregion. Unlike cismontane chaparral, which forms dense, impenetrable stands of plants, desert chaparral is open, with only about 50 percent of the ground covered. Individual shrubs can reach up to 10 feet (3.0 m) in height. Transmontane chaparral or desert chaparral is found on the eastern slopes of major mountain range systems on the western sides of the deserts of California. The mountain systems include the southeastern Transverse Ranges (the San Bernardino and San Gabriel Mountains) in the Mojave Desert north and northeast of the Los Angeles basin and Inland Empire; and the northern Peninsular Ranges (San Jacinto, Santa Rosa, and Laguna Mountains), which separate the Colorado Desert (western Sonoran Desert) from lower coastal Southern California. It is distinguished from the cismontane chaparral found on the coastal side of the mountains, which experiences higher winter rainfall. Naturally, desert chaparral experiences less winter rainfall than cismontane chaparral. Plants in this community are characterized by small, hard (sclerophyllic) evergreen (non-deciduous) leaves. Desert chaparral grows above California's desert cactus scrub plant community and below the pinyon-juniper woodland. It is further distinguished from the deciduous sub-alpine scrub above the pinyon-juniper woodlands on the same side of the Peninsular ranges. Transmontane (desert) chaparral typically grows on the lower (3,500–4,500 feet (1,100–1,400 m) elevation) northern slopes of the southern Transverse Ranges (running east to west in San Bernardino and Los Angeles counties) and on the lower (2,500–3,500 feet (760–1,070 m)) eastern slopes of the Peninsular Ranges (running south to north from lower Baja California to Riverside and Orange counties and the Transverse Ranges). It can also be found in higher-elevation sky islands in the interior of the deserts, such as in the upper New York Mountains within the Mojave National Preserve in the Mojave Desert. Hesperoyucca whipplei (syn. Yucca whipplei), foothill yucca – our lord's candle. Chaparral is a coastal biome with hot, dry summers and mild, rainy winters. The Chaparral area receives about 38–100 cm (15–39 in) of precipitation a year. This makes the chaparral most vulnerable to fire in the late summer and fall. The chaparral ecosystem as a whole is adapted to be able to recover from infrequent wildfires (fires occurring a minimum of 15 years apart); indeed, chaparral regions are known culturally and historically for their impressive fires. (This does create a conflict with human development adjacent to and expanding into chaparral systems.) Additionally, Native Americans burned chaparral to promote grasslands for textiles and food. Before a major fire, typical chaparral plant communities are dominated by manzanita, chamise (also called greasewood; Adenostoma fasciculatum) and Ceanothus species, toyon (which can sometimes be interspersed with scrub oaks), and other drought-resistant shrubs with hard (sclerophyllous) leaves; these plants resprout (see resprouter) from underground burls after a fire. The shoots of these plants are, however, not resistant to chaparral crown-fire regimes as the bark is simply not thick enough. Plants that are long-lived in the seed bank or serotenous with induced germination after fire include chamise, Ceanothus, and fiddleneck. Some chaparral plant communities may grow so dense and tall that it becomes difficult for large animals and humans to penetrate, but may be teeming with smaller fauna in the understory. Many chaparral plant species require some fire cue (heat, smoke, or charred wood, and chemical changes in the soil following fires) for germination. Others, such as annual and herbaceous species like Phacelia require fires to allow sunlight to reach them, and are known as fire followers. During the time shortly after a fire, chaparral communities may contain soft-leaved herbaceuous annual plants that dominate the community for the first few years – until the burl resprouts and seedlings of chaparral perennials create an overstory, blocking the sunlight from other plants in the community. When the overstory regrows, seeds of annuals and smaller plants may lie dormant until the next fire creates the conditions required for germination. Mid-sized plants such as Ceonothus fix nitrogen, while others cannot, which, together with the need for exposure to the sun, creates a symbiotic relationship of the entire community with infrequent fires. Because of the hot, dry conditions that exist in the California summer and fall, chaparral is one of the most fire-prone plant communities in North America. Some fires are caused by lightning, but these are usually during periods of high humidity and low winds and are easily controlled. Nearly all of the very large wildfires are caused by human activity during periods of very hot, dry easterly Santa Ana winds. These man-made fires are commonly caused by power line failures, vehicle fires and collisions, sparks from machinery, arson, or campfires. In natural Chaparral communities without human interference, the fires are ignition-prone as there are plenty of ground fuels and the temperatures are fire-permitting during the dry season. Though adapted to infrequent fires, chaparral plant communities can be exterminated by frequent fires. A moderate frequency of fire (less than ten years) will result in the loss of seeder plants such as Manzanita spp. This moderate frequency disallows seeder plants to reach their reproductive size before the next fire and the community shifts to a sprouter-dominance. High frequency fires (less than five years) can cause the additional loss of sprouters by exhausting their reserves below-ground. Today, frequent accidental ignitions can convert chaparral from a native shrubland to non-native annual grassland and drastically reduce species diversity, especially under drought brought about by climate change. There are two assumptions relating to California chaparral fire regimes that appear to have caused considerable debate, and sometimes confusion and controversy, within the fields of wildfire ecology and land management. That wildfire suppression policies have allowed dead chaparral to accumulate unnaturally, creating ample fuel for large fires. The perspective that older chaparral is unhealthy or unproductive may have originated during the 1940s when studies were conducted measuring the amount of forage available to deer populations in chaparral stands. However, according to recent studies, California chaparral is extraordinarily resilient to very long periods without fire and continues to maintain productive growth throughout pre-fire conditions. Seeds of many chaparral plants actually require 30 years or more worth of accumulated leaf litter before they will successfully germinate (e.g., scrub oak, Quercus berberidifolia; toyon, Heteromeles arbutifolia; and holly-leafed cherry, Prunus ilicifolia). When intervals between fires drop below 10 to 15 years, many chaparral species are eliminated and the system is typically replaced by non-native, invasive, weedy grassland. The idea that older chaparral is responsible for causing large fires was originally proposed in the 1980s by comparing wildfires in Baja California and southern California . It was suggested that fire suppression activities in southern California allowed more fuel to accumulate, which in turn led to larger fires (in Baja, fires often burn without active suppression efforts). This is similar to the argument that fire suppression in western United States has allowed ponderosa pine forests to become "overstocked". In the past, surface fires burned through these forests at intervals of anywhere between 4 and 36 years, clearing out the understory and creating a more ecologically balanced system. However, chaparral has a crown-fire regime, meaning that fires consume the entire system whenever they burn, with a historical frequency of 30 to 50 years. In one study, a detailed analysis of historical fire data concluded that fire suppression activities have been ineffective at excluding fire from southern California chaparral, unlike in ponderosa pine forests. In addition, the number of fires is increasing in step with population growth. Chaparral stand age does not have a significant correlation to its tendency to burn. Low humidity, low fuel moisture, and high winds appear to be the primary factors in determining when and where a chaparral fire occurs and how large it becomes. Fires can be beneficial to plant communities by clearing away canopies of litter, inducing serotenous germination, and sanitizing the soils from pathogens. ^ a b "Discovering Rainforest Locations". California Academy of Sciences. ^ Venturas, Martin D.; MacKinnon, Evan D.; Dario, Hannah L.; Jacobsen, Anna L.; Pratt, R. Brandon; Davis, Stephen D. (2016-07-08). "Chaparral Shrub Hydraulic Traits, Size, and Life History Types Relate to Species Mortality during California's Historic Drought of 2014". PLOS ONE. 11 (7): e0159145. doi:10.1371/journal.pone.0159145. ISSN 1932-6203. PMC 4938587. PMID 27391489. ^ "The Biodiversity Hotspots_Conservation International". Archived from the original on 2007-07-14. ^ Knowling, Doug (2016-10-10). Ecological Restoration: Wildfire Ecology Reference Manual. Lulu.com. ISBN 9781365453458. ^ Fire, native peoples, and the natural landscape. Vale, Thomas R., 1943-. Washington, DC: Island Press. 2002. ISBN 9781559638890. OCLC 614708491. ^ Thanos, C. A.; Rundel, P. W. (1995). "Fire-Followers in Chaparral: Nitrogenous Compounds Trigger Seed Germination". Journal of Ecology. 83 (2): 207–216. doi:10.2307/2261559. JSTOR 2261559. ^ Syphard, Alexandra D.; Radeloff, Volker C.; Keeley, Jon E.; Hawbaker, Todd J.; Clayton, Murray K.; Stewart, Susan I.; Hammer, Roger B. (2007-07-01). "Human Influence on California Fire Regimes". Ecological Applications. 17 (5): 1388–1402. doi:10.1890/06-1128.1. ISSN 1939-5582. ^ Pratt, R. Brandon; Jacobsen, Anna L.; Ramirez, Aaron R.; Helms, Anjel M.; Traugh, Courtney A.; Tobin, Michael F.; Heffner, Marcus S.; Davis, Stephen D. (2014-03-01). "Mortality of resprouting chaparral shrubs after a fire and during a record drought: physiological mechanisms and demographic consequences". Global Change Biology. 20 (3): 893–907. doi:10.1111/gcb.12477. ISSN 1365-2486. PMID 24375846. ^ Hanes, Ted L. (1971-02-01). "Succession after Fire in the Chaparral of Southern California". Ecological Monographs. 41 (1): 27–52. doi:10.2307/1942434. ISSN 1557-7015. JSTOR 1942434. ^ Minnich, Richard A. (1983-03-18). "Fire Mosaics in Southern California and Northern Baja California". Science. 219 (4590): 1287–1294. doi:10.1126/science.219.4590.1287. ISSN 0036-8075. PMID 17735593. ^ a b Keeley, Jon E.; Pfaff, Anne H.; Safford, Hugh D. (2005-10-03). "Fire suppression impacts on postfire recovery of Sierra Nevada chaparral shrublands*". International Journal of Wildland Fire. 14 (3): 255–265. doi:10.1071/wf05049. ISSN 1448-5516. ^ Hubbard, R.F. (1986). Stand Age and Growth Dynamics in Chamise Chaparral. San Diego: Master's thesis, San Diego State University. ^ Larigauderie, A.; Hubbard, T.W. ; Kummerow, J. (1990). "Growth dynamics of two chaparral shrub species with time after fire". Madroño. 37: 225–236. ^ Keeley, Jon E. (1995). "FUTURE OF CALIFORNIA FLORISTICS AND SYSTEMATICS: WILDFIRE THREATS TO THE CALIFORNIA FLORA". Madroño. 42 (2): 175–179. JSTOR 41425064. ^ Haidinger, Tori L.; Keeley, Jon E. (1993). "Role of high fire frequency in destruction of mixed chaparral" (PDF). Madroño. 40: 141–147. ^ Zedler, P.H. (1995). Keeley, J.E. ; Scott, T, eds. "Fire frequency in southern California shrublands: biological effects and management options". Brushfires in California Wildlands: Ecology and Resource Management: 101–112. ^ Moritz, Max A.; Keeley, Jon E.; Johnson, Edward A.; Schaffner, Andrew A. (2004-03-01). "Testing a basic assumption of shrubland fire management: how important is fuel age?". Frontiers in Ecology and the Environment. 2 (2): 67–72. doi:10.1890/1540-9295(2004)002[0067:tabaos]2.0.co;2. ISSN 1540-9309. Hubbard, R.F. 1986. Stand age and growth dynamics in chamise chaparral. Master's thesis, San Diego State University, San Diego, California. Vale, T. R. (2002). Fire, Native Peoples, and the Natural Landscape. Washington, DC, USA: Island Press. This page was last edited on 4 April 2019, at 16:45 (UTC).